STAGING Solo #2 (2017) is an iteration derived from Maria Hassabi’s multi-sited live installation STAGING (2017), previously exhibited at the Walker Art Center, Minneapolis and documenta 14, Kassel. In STAGING: Solo #2, a singular performer, an expanse of a vivid pink carpet, and an ambient soundscape are installed in the monumental space of the Grabbe Halle at K20, Kunstsammlung NRW, Düsseldorf. The lone figure in a brightly patterned outfit moves at a measured pace, morphing the body at slow, sometimes imperceptible velocities, as it enacts a two-hour choreographic cycle that loops throughout the museum’s opening hours. Creating a recurrent form that occupies a specific space and seemingly unbroken time, the performer subtly negotiates their task: a detailed choreographic script, the representation of the space itself, and the expectations of the viewer. The initial invitation of a spectacle exhausts itself, and the possibility for an intimate exchange within a quiet site emerges. STAGING Solo #2 (2017) is produced by Kunstsammlung Nordrhein-Westfalen, Düsseldorf. Funded by Ministerium für Kultur und Wissenschaft des Landes Nordrhein-Westfalen. STAGING (2017) is the second part of a performative diptych, along with STAGED? (2016). 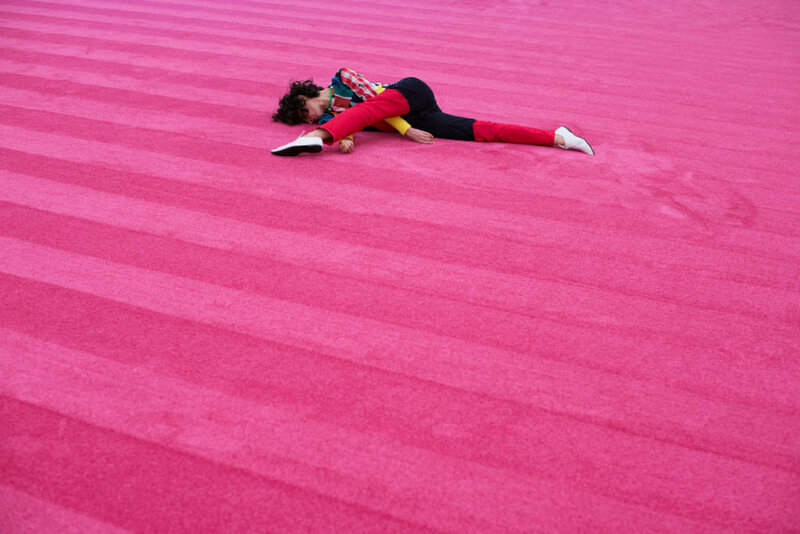 The two works contain similar elements – choreographic material, color palette, light and sound installations, vivid pink carpet – and exist as separate entities, each reflecting the distinct frameworks of their presentation. STAGED?, created for theater spaces, considers the hierarchies of the theatrical apparatus, while STAGING, presented in exhibition contexts, destabilizes similar codes and relationships within institutions. While STAGED? has a set duration, a beginning and an end, STAGING is created in the form of a loop, with its duration determined by the venues’ opening hours. STAGING unfolds as a progression of encounters, installed in multiple sites throughout the building. Apprehended in parts, the accumulation of bodies, colors, sound, light, and architecture, are reminders of multiple fractures of an event that is continually in progress, always STAGING, and which only finds completion in its STAGED? theatrical form. *** Responding to exhibition contexts, various iterations of STAGING include all or combinations of parts. STAGING – undressed, is an adaptation for public spaces, represented solely by its performers. Performers (STAGING: quartet): Jessie Gold, Hristoula Harakas, Maria Hassabi, Oisín Monaghan. Performers (STAGING: solo): Kennis Hawkins, Niall Jones, Mickey Mahar, Paige Martin, Omagbitse Omagbemi, Nancy Stamatopoulou. Coproduced by Aarhus 2017, Denmark; documenta14, Kassel; Evergreen/Don River Valley Park, Toronto; Keir Foundation, Sydney; with support from Dancehouse, Melbourne; Ministry of Education and Culture, Cyprus; Walker Art Center, Minneapolis; Ammodo Foundation, Amsterdam. Partially developed in-residency at Baryshnikov Arts Center, New York.